Computer-controlled titrator for thermometric titration. Including complete accessories for the titration (10 mL buret, titration stand with rod stirrer, Thermoprobe, titration vessel and tiamo™ light). Metrohm 859 Titrotherm is a USB-enabled thermometric titrator with one measuring input each for a Thermoprobe and a potentiometric sensor as well as four MSB connections for 800 Dosino® and stirrers. Titrotherm software, a Thermoprobe and a USB connecting cable for a PC are also included. Titration is the oldest and most widespread method used in analytical chemistry. For a long time now, potentiometric sensors (indicator electrodes) have been used to cover a wide range of applications in the titration field. 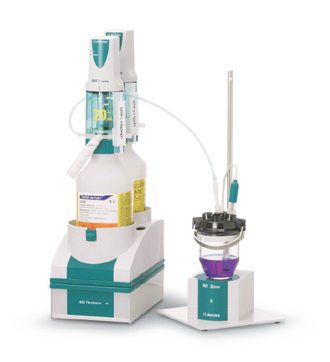 As a result, potentiometric titration has become an established analytical method and features many standards. The electrochemical potential is only one of the possible ways of following a chemical reaction. A far more universal parameter is the reaction enthalpy. Every chemical reaction is accompanied by a change in enthalpy (_H). As long as the reaction takes place, this results in either an increase (exothermal reaction) or decrease (endothermal reaction) in the temperature of the sample solution. For a simple reaction this means that the increase or reduction in temperature depends on the converted amount of substance.